Duct tape. The miracle material was invented in 1942. 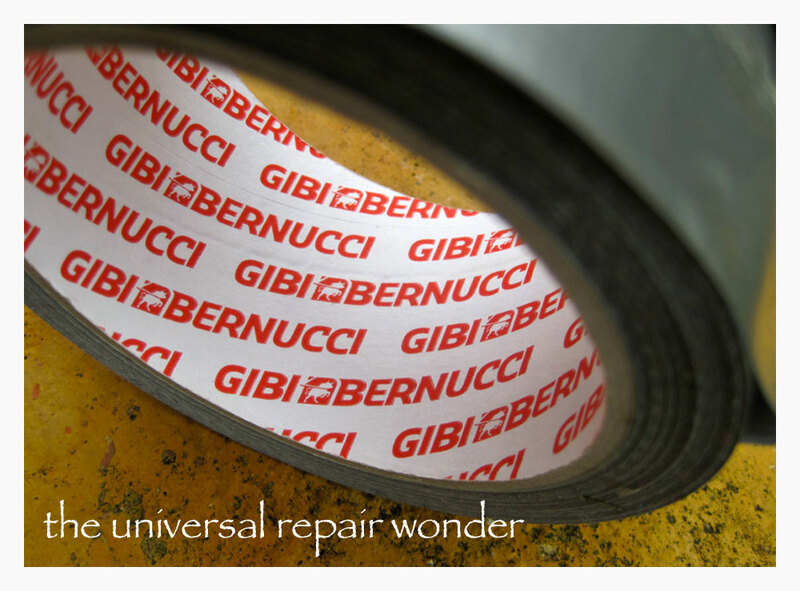 Since then, it has been acclaimed as the perfect solution to fix just about anything, from a broken pipe to aircraft. More recently, its versatility has brought it to the forefront of fashion design, bizarre costumes, competitions, and even sitcoms. We thought we’d seen it all with the complete construction of a sailboat and the functional cannon, but we were wrong. There was more questionable “creativity” in store for that ever-popular item we either call duct tape, or duck tape—you choose. Our own experience confirms the utility of that gray sticky stuff. Created as a quick-fix for sealing ammunition cases in world war II, it made its way into the everyday lives of people around the world, becoming part of the arsenal of creativity. We asked the guy at our local ferramenta, hardware store what he called it, and with an appropriate accent, and shoulder shrug, he said . . . ducta tapa! (Italians MUST end each word with a vowel.) Of course. What else? It’s become part of our global language and experience. not pretty, but it works! 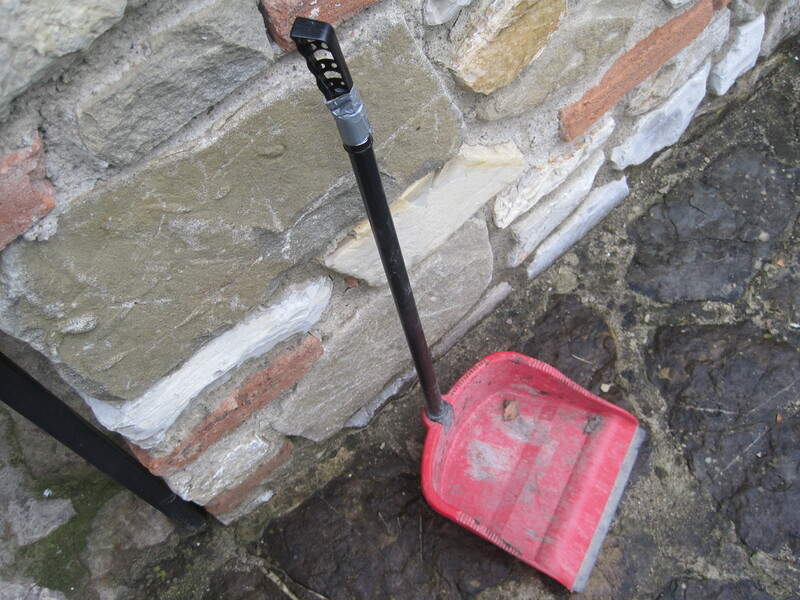 We’re not above initiating our own money-saving fix-it schemes which include the clever cure for our tattered lawnmower bag (see above photo), and the magical reattachment of the broken handle on our 3 euro stand-up Italian dustpan. Those are two of the most recent successes, and some of the least embarrassing examples of our own ingenuity. Simply amazing stuff! Nobody ever said it would be attractive—for good reason. But as for speed, functionality and dependability, it can’t be beat. Recently, while on a short visit to the little country town of Ronchamp, France, we became deeply visually disturbed. We rely on the French to be the torch-bearers for aesthetic sensibilities in our crazy world. But disillusionment set in when we discovered an ugly French faux pas. On an evening walk to a nearby restaurant, we were simultaneously offended both functionally and aesthetically. 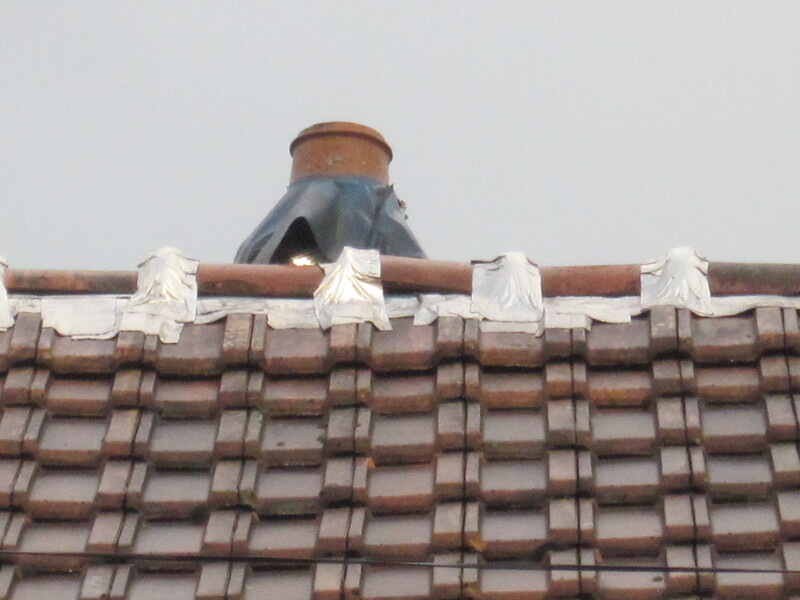 There, to our surprise and dismay, that wonder product had made its way onto the ridge of a clay tile roof. 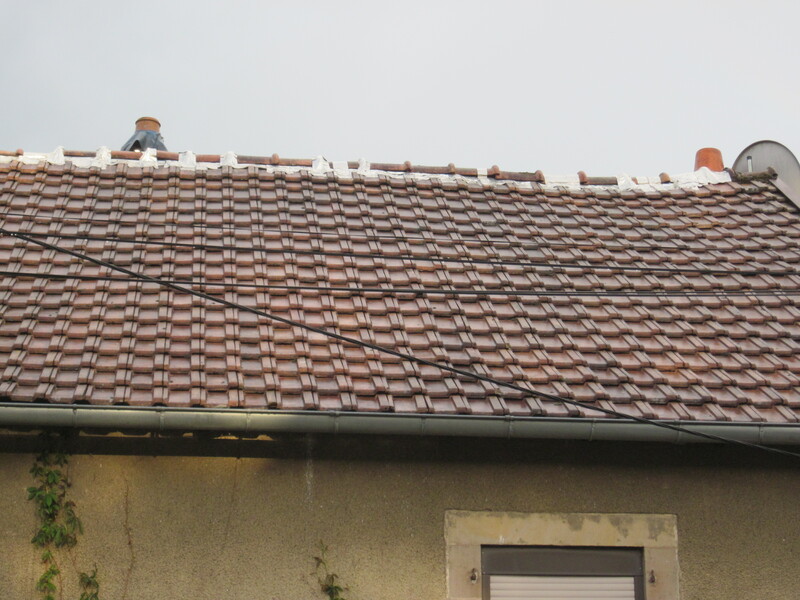 That’s right: a roof-top duct tape repair! Perhaps it was the alarming juxtaposition of that space-age product on such a sacred, ancient, natural building material. The shiny gray reflections against the beautiful terracotta tones were more than a bit jarring. Ingenuity had gone too far! Instead of a handyman’s reliable mending tool, it had become the lazyman’s dream. 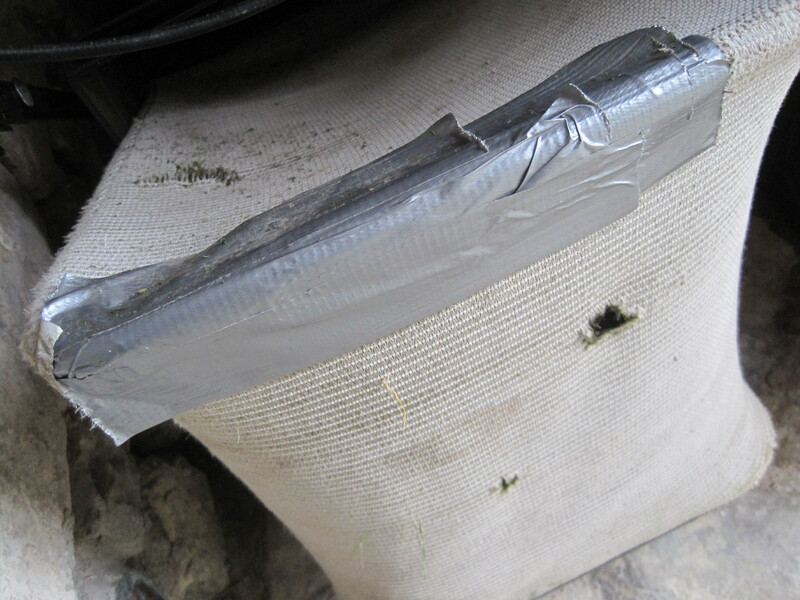 No longer just a quick-fix, but rather a cheap, seemingly long-term patch-job. There’s an old saying, “When you have a hammer, everything looks like a nail.” In this case, “When you have a roll of duct tape, every solution is just an easy quick rip and slap away.” But . . . easy doesn’t make it right! It looks like the all purpose mending tape, originally designed to seal ammunition cases has “backfired” on us, so to speak. It’s high time to take a stand and start fighting back against the misuse of such a wonderful material. Duct tape abuse is no laughing matter! Note: You may also enjoy our story called “The Ahhh Factor,” which is also about the French town of Ronchamp.